MacroMonday 2 - Flowers - This is from the Spring Prelude which is happening right now at Butchart Gardens. It is amazing! You can see snow in the background. Below we have my Flicker. All the birds are with the letter "F" today. Our World Tuesday For Our World we have a hawk in a field of cabbages, eagles in a field eating something furry and an eagle flying over a farm. These are some House Finches and a Fox Sparrow is in there also. 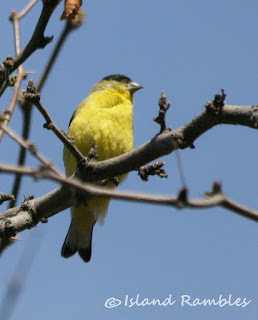 The yellow one is a yellow-morph House Finch. Wild Bird Wednesday For Wild Bird we have some Fox Sparrows. The white one is a leucistic Fox Sparrow. This is a condition in which there is partial loss of pigmentation in an animal resulting in white, pale, or patchy coloration of the skin, hair, feathers, scales or cuticle, but not the eyes. ABC Wednesday For ABC we have a Flycatcher and some Finches, Goldfinches. We are at the letter "f"
GoodFences Thursday The fence above is at the Nature House at Beaver Lake. Snow is gone now. Free book recommendations for you. Free online unblur your photos in 30 seconds. Delete old accounts or see if you can delete them. Can't decide what to watch, check out the roulette. Easy Movie Maker takes over from Windows Live Movie Maker. Recommended by Microsoft as they no longer update their Live Movie Maker. It is more advanced than Windows Live and is approved by Microsoft. My apologies as this is very heavy in photos today. I tried to use the Google photos collage maker and realized that it organized everything in date order and I have too many photos and have been blogging for too long to go and use that thing. Now will have to find a collage maker again. Also my creations disappeared! I am finding the new Google photos very stressful. Thanks Sue. Yes the House Sparrows are so pretty and colorful. Lovely photos. I too am amazed at the large variety of birds you shoot. You are fortunate to have so many subjects to photograph. Your lovely photos give me hope that Spring is nearby. I love Cherry blossoms in Spring and birds. Have a beautiful week ahead. Thanks Joyful. I hope Spring comes soon! I think it has been our coldest winter. thanks Ruth, nice to see you. Lovely birds! I use photocollage.com. Oh thanks Linda, I will give photocollage a try! Hi Fiona, thanks so much for your visit from Sweden! Nice shots - love the falcons at the end. Hi Stewart, thanks so much for taking the time from your holiday in India! Nice photos from India on your site. Hello, awesome birds and photos. I love the eagles and the yellow House Finch is lovely. Happy Valentine's Day, enjoy your new week ahead! Thanks Eileen, you have so many birds in your area. Send some of them here! Happy Valentine's Day to you and your loved ones. We are enjoying this special day in Arkansas at our special little cabin on the mountain! Love your Flicker... We have them also.... Our woodpeckers are so special to me. We have Pileated, Downys, Hairys, Red-bellied, Red-Headed, and Nothern Flickers.... The Red-Headed are definitely the prettiest in my opinion. Hi Betsy, the photos of your cabin in the mountains are wonderful. I would love to see a Red-Headed woodpecker. I would happily see all those birds. Thank you so much for sharing your pictures. Thanks Findlay, so nice to hear from you. It has been a long time. I really enjoyed that post about the Harrier. Merci Celine and Philippe! We blog together for too long I think I type in French now. Good luck with the collage maker. It sounds like a very useful tool. Meanwhile, you gave us plenty of photos to contemplate. Not a bad thing at all for a photoblog! That is a range of photographs.. enjoyed every bit of it. Thank you. So many more lovely shots! What a great series of birds!